Barrier Terminal Blocks are manufactured from brass, copper, nickle plated brass, aluminium, steel, stainless steel, polyamide, polymer or any material composition as per custom specification. Barrier type Terminal Blocks construction design include short metal strips, insulated barrier, connectors and screws for termination, installation and wire connection. They are available with different types of terminal pins, screws, base material or any type of design configuration as per custom industrial specification. Barrier Type terminal blocks are available with or without covers. 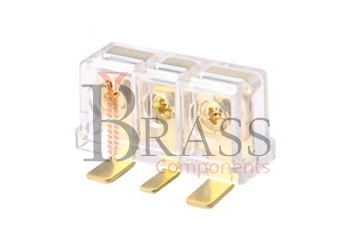 The standard range of Barrier Terminal Blocks are available with chrome, brass, nickle plated brass, zinc, electrolyte tin or any finishing or coating as per custom specification and requirement. Corrosion Resistant and Impact Resistant. Greater pitch to withstand higher voltage. Available in different range of size, screws, base, material and other configuration. Provide maximum flexibility to design a part which will fit to specific applications. Available with large and robust terminal interface. Provide quick and easy installation and termination. Provide protection to prevent loosening of wire due to vibration. For maximum power distribution flexibility. Widely used in high current and voltage applications. Suitable for panel or rail mounting. Especially used for wiring and field connection. Ideal for electronic and control feed through applications where space is limited. Ideal for used in electronics, automotive, commercial, power and distribution industries. We manufacture Barrier Terminal Blocks as per Custom Specification and export in France, Italy, Switzerland, Poland, Greece, UK and other European Countries. For more Information, Please Contact Us or Inquiry Now.